The heartwarming success of Stardew Valley has taken on an even brighter note, thanks to its debut on Nintendo's latest console. According to Nintendo's official worldwide rankings, the farm-life RPG was the most-downloaded Switch eShop exclusive title in 2017. 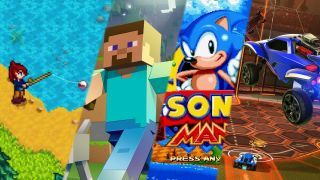 It beat out the juggernaut that is Minecraft, which took second place, as well as Sonic Mania and Rocket League at No. 3 and 4 respectively. All that despite Stardew Valley releasing later in the year (and thus having less time to rack up sales) than the others. Both Minecraft and Rocket League were phenomena of their own, though their respective fervors had died down a bit by the time they arrived on Switch. Still, when you remember that Stardew Valley was almost entirely the product of a single person's labor and deep, deep love for Harvest Moon, it's all the more impressive (Minecraft started out as a one-person project too, but it's had a whole studio behind it for many years now). Here's an extended list of the top 10 global eShop bestsellers on Switch. Remember that this list only includes download-exclusive titles (or chiefly download, I believe, if they have limited physical versions), so you're not going to see games like The Legend of Zelda: Breath of the Wild or Super Mario Odyssey on it. The staying power of Minecraft has already been made manifest. Will Stardew Valley hold on to its ranking even as the upcoming Nintendo Switch games of 2018 start pouring in? Whoever wins… we also win, because these games are rad and this system is rad. Nice.